WeOwnTV is a collaborative media education project that promotes self-expression and works with filmmakers from underserved communities and balances intensive media production training with professional development. Our programs focus on community engagement and support filmmakers and artists through direct grants, professional mentorship, and media education. We also work with filmmakers on promotion and distribution of finished work enabling these young talents to share their stories and ideas with the world. To date, our work has been regionally focussed in Sierra Leone, Liberia, Guinea and Ghana. 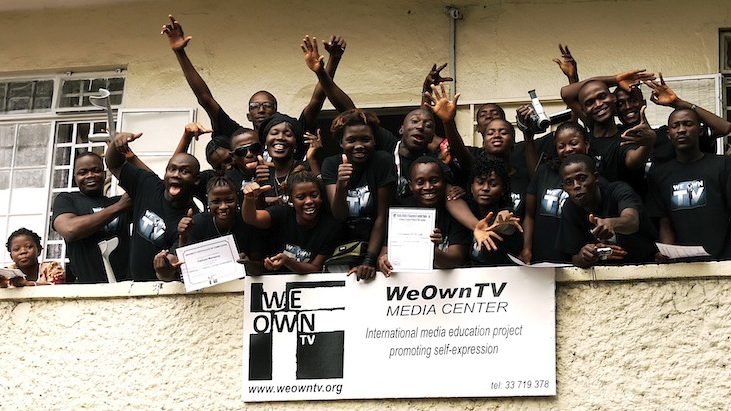 “WeOwnTV” in Sierra Leone’s native Krio language, means “Our Own TV.” Personal and community ownership are the core pillars for establishing this collaboration. We have continued to encourage and support young media makers, artists and journalists to take the lead in their own development and creative exploration. This spirit of self reliance is paramount to building a culture of creativity and professionalism. It is on this foundation that WeOwnTV has built our core programs and mechanisms of support. WeOwnTV is an initiate of the San Francisco based non-profit, Mirabel Pictures. In 2002, I (Banker White) began working on the documentary film Sierra Leon’s Refugee All Stars (2006) with Zach Niles and Chris Velan. As a part of our outreach effort for that film we developed the concept of WeOwnTV. The idea was to engage young media members in a supportive environment, merging self expression and creativity with with the concept ownership. In 2009, we launched our first program in Sierra Leone by facilitating a month-long filmmaking workshop for 18 young men and women just outside the capital city Freetown together with Sierra Leonean media makers Arthur Pratt and Lansana ‘Barmmy Boy’ Mansaray. In 2010 , we established a US based non-profit to continue support media makers in the region. That same year we helped launch the brick and mortar Freetown Media Centre with Barmmy and Arthur. Today, after almost a decade since we opened its doors the Media Center has grown into a vibrant professional collective that houses some of the most respected and sought after media-makers in the country. To date we have worked with and trained over 300 media makers via workshops, training and collaborative productions. This collaboration also took on new meaning in the context of the Ebola outbreak, which struck in 2014. Since the earliest days of the outbreak, WeOwnTV supported the production of educational materials created by Freetown Media Centre that rapidly disseminated life-saving, culturally sensitive information at a critical time. These films were quickly identified by healthcare professionals in the region as being extremely effective in getting the messages out in a way local communities could relate to. Here are some reports about their efforts covered on BBC Newshour and the Daily Beast that praise our efforts. In 2018 we released the feature length documentary SURVIVORS was a coproduction of the Freetown Media Centre and WeOwnTV.